This is Mikey. I met him when I lived in Grand Rapids. Mikey's big love (before me, of course) was snowboarding. Snowboarding and monkeys. His friends all called him G-Monkey. I called him Mikey. Mikey never took me snowboarding. I asked him once to teach me and he said that snowboarding isn't really something you can teach someone, it's something you have to figure out on your own. Ok, maybe that's true...but don't you think he could have taken me and showed me how to go about putting on the board and whatever else you need to know before you "figure it out on your own"? Of course, at that point we lived in Champaign, Illinois, in the middle of flat prairie, so ski hills were hard to come by. 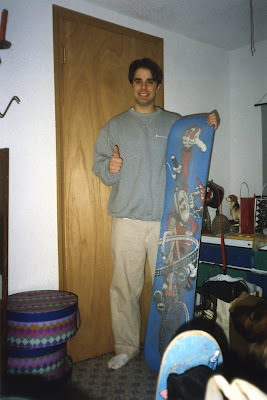 In the 15 years since this picture was taken, I have still never tried snowboarding. Well, guess what, Mikey?? I'm going on Saturday and I'm gonna figure it out on my own! And my friend Kristen is going to be the one who shows me how to put on the board and whatever else I need to know. You missed your chance! Yea, what she said. Take that G-Monkey!